10th-Inning Homer Wins Lower-Stakes All-Star Game For American League : The Two-Way For the first time since 2002, home field advantage in the World Series wasn't on the line in the exhibition, but the AL's 2-1 win was still hard-fought. 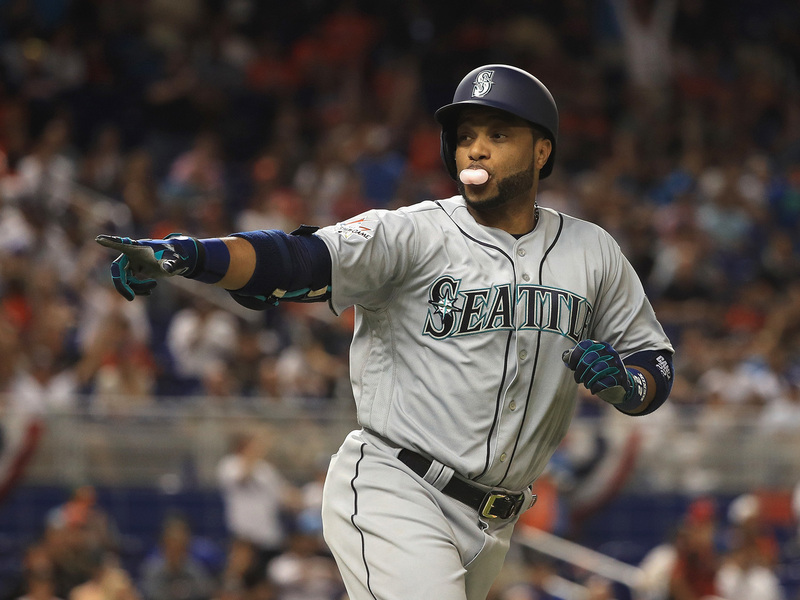 Robinson Cano of the Seattle Mariners blows a bubble as he rounds the bases after hitting a home run in the tenth inning of Tuesday's MLB All-Star Game in Miami. It would be the winning run for the American League. 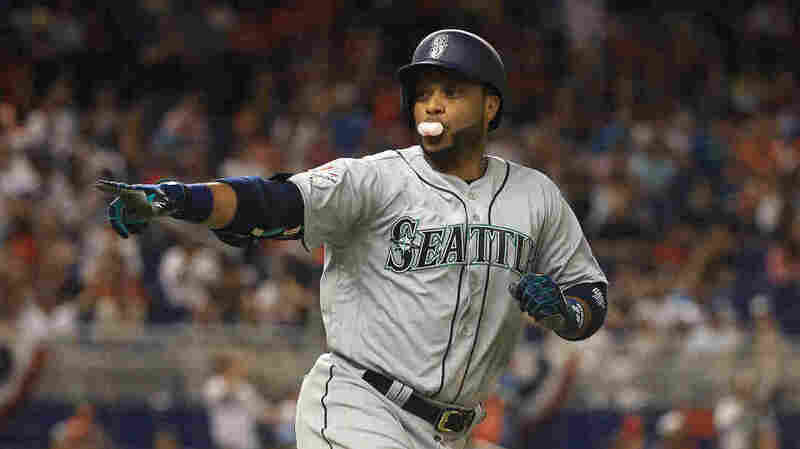 Seattle Mariners second-baseman Robinson Cano's home run off a changeup from the Chicago Cubs' Wade Davis won the Major League Baseball All-Star game Tuesday night in Miami, but that won't mean as much for the American League as in recent years. The 2017 game was the first since Major League Baseball ended its 13-season long practice of using the All Star Game to determine World Series home field advantage. That initiative, known as "This Time It Counts," was a response to a controversial extra-innings tie in 2002. Starting with this season, the team with the best regular-season record will have home field advantage in the Series. Overall it was a game dominated by the pitchers on both sides, who struck out a combined 23 batters. The only runs before extra innings came on a homer by Cardinals catcher Yadier Molina in the sixth inning for the National League, and a bloop single in the fifth by Miguel Sano of the Minnesota Twins, scoring the Baltimore Orioles' Jonathan Schoop from second. Cleveland Indians pitcher Andrew Miller wrapped things up in the bottom of the 10th, with help from a sprinting catch by outfielder Justin Upton of the Detroit Tigers. The win was the fifth straight for the American League, its 17th win since 1996, and evens the overall record of the games: 43 wins for the National League, 43 for the American League, and two ties. "Cano's homer came exactly 50 years after the previous extra-inning homer in an All-Star Game, when Tony Perez hit a tiebreaking 15th-inning shot off Catfish Hunter in the NL's 2-1 win at Anaheim, California. Perez, now a Marlins executive, was among eight Latin-born Hall of Famers who threw out ceremonial first pitches." With home field advantage no longer on the line, Tuesday night's game was a bit looser, including an impromptu home plate photo request by the Seattle Mariners' Nelson Cruz, who had Molina snap a shot of him and veteran umpire Joe West during his at-bat.